There have been some huge moves for teams on the sideline, during the off-season. Some that were expected and some that may have been more on the “eye opener” category. Looking at some of the bigger moves, we had the Indianapolis Colts fired HC Chuck Pagano. The Raiders made the heavyweight play and paid Jon Gruden to go back as their Head Coach. Cincinnati extended HC Marvin Lewis to come back in 2018. The New York Giants snagged up Pat Shurmur as their Head Coach. The Chicago Bears dumped off and fired John Fox. And we also got the slightly expected news that Arizona’s Bruce Arians retired. As those teams look for who will lead their franchises next, let’s take a look back at the many coaching mistakes throughout the 2017 season. For some NFL fans, there is some kind of hope in the off-season. When their team dominates the headlines. When their team is making the big splashy move. When hope is blossoming and everyone is back to 0-0, and when they have a shot to have the big moves and improve their team. Up to, and including, trying to get or keep a great coach – which can often make up for a lot of nothing else for a teams and its confidence. Week 5 was pretty much the last time the Colts were relevant last year. When they were moving along at a middling and savable 2-3, putting up just 19/game. Later in the season – they were even more stagnant, and Chuck Pagano went belly up to close out their miserable season at 4-12 overall. He put the offense in a bad place, and we all know what happened to the team next. Instead of going for the big plays with T.Y. Hilton and Donte Moncrief – he decided setting up a ground and pound attack with a 34 year old RB was a better game plan for Indy. This set the tone for the Colts season. Pagano had some issues challenging plays, and didn’t manage things very well. Oftentimes settling for a field goal when they could have made gutsy calls and try to keep their struggling offense on the field, and at least try to make something happen. Losing Pagano was a big decision, that I feel was the right move, and after his last season – the Colts made the right decision to part ways from the 57 year old. Pat Shurmur was very successful for the Minnesota Vikings in 2017. He inspired and got great play from 29 year old QB Case Keenum and got the Vikes putting up almost 4 more pts than they scored in 2016. Given the recent slump New York has currently been mired in. With just 15ppg in 2017 – and just 1 season out of the last 5 with a winning record – they need to make a move. They needed to make a strong splash, and quickly. With the Eagles winning the championship, and Dallas looking like they are getting refreshed and ready – they need to make a move to try and regain some swagger back in the East. The Giants are actually good enough to get themselves out of this terrible hole they have gotten into, and they did. Shurmur will look to their veteran QB as part of the legit reason why. Thanks to the hot rip the Vikes went on last year, with Case Keenum, the team had a great rise before the team buckled down the stretch, which inevitably cost them a shot to the Bowl, Shurmur has a lot of expectations on his shoulders. Shurmur has been a big coaching name for a few years now and him getting his chance to thoroughly impress those in New York – the Giants and fans will be having high hopes with Pat Shurmur.Oakland had issues throughout the season – and Jack Del Rio put his job in jeopardy long before the season ended. Jon Gruden going back to Oakland likely included the fact that he had a young exciting quarterback like Derek Carr that will certainly facilitate the Raiders success for years to come. Gruden was just 57-55 in his 7 years in Tampa Bay from 2002 to 2008, and went 38-26 when in Oakland. On the whole, his coaching tenure has been just decent with a 54% head coach win percentage, which is just above average and doesn’t blow away anyone – but he brings a SuperBowl winning mentality and vibrancy to a Raiders franchise that has been terrible, overall with their coaching decisions since 2002. The Raiders did not want to stick with Del Rio – he was good in 2016 – but seemed to lose steam. Gruden will be bringing control and leadership to a legendary team that needs it. It’s an understandable change for the Raiders, and quite honestly, it wasn’t completely shocking. The Raiders were just 23rd on offense, and Del Rio played a part in that. Here is what will likely happen with this coaching move. Oakland will win at least 2 more games in 2018, that they shouldn’t. And they also will be division champions after a short time. Gruden was a fan favorite for years for Oakland for years, and they are thrilled to have him back. This move represents “acceptance” to Cincinnati fans. I don’t possibly imagine he can capture anything for this team, that is in dangerous spiraling mode. I’m extremely skeptical, and not hopeful if I am a Bengals fan. What I always liked about Marvin Lewis is his demeanor on the sidelines, but his lack of passion and game planning is painfully hard to disagree with. The Bengals screwed up, the office will expect him to turn this team around…again…right away, but that isn’t going to happen, it will likely be anther 7-9 season, and non existent playoffs. John Fox was a huge part of the problems for the Bears failures. The John Fox firing was long overdue. With just 14 wins since 2015 – it cannot be denied as to why this was the right move for Chicago. Fox lost several seasons of Alshon Jeffery’s prime, and he inexplicably kept the Bears in the bottom of the North year after year. Fox seemed to have a very disagreeable personality and his poor team production ended up costing him – ultimately leading to his firing. NFL owners for the past several years, seem they don’t waste anytime anymore when it comes to firing a coach. At times, it is too quick, and others, they hold on to far for too long. John Fox was a poor coach for Chicago. Him being released made complete sense to me. 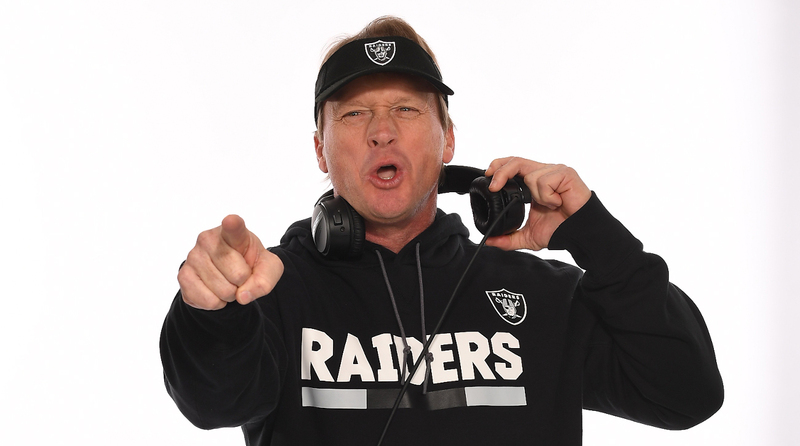 The Raiders should be excited to be rid of Del Rio and welcome their new Head Coach Jon Gruden. It is a very exciting time for Oakland. And he will keep their dreams and play on the field high. If the Raiders have ever had the desire to build a serious team – they have a coach who is in a great place to do it. Pat Shurmur actually can build a contender if he stays in New York for a few years. The challenge will be getting Eli Manning believing, who lost a lot of fire, because of bad coaching, to get back on track. They will be a contender very soon as well if the rest of the team buys in. One thing is for sure, the New York Giants are getting one good coach. Marvin Lewis getting extended is perhaps the biggest surprise of the coaching moves – as he endured losing season after losing season. Lewis has not been able to lead a team, and his 13-18-1 record over the last 2 seasons is nothing to hang your teams heart and dreams on.